Clothesline bans may be familiar to folks in other parts of the country, but to lifelong Vermonters, they were an affront to our unique way of life. As communities grew, some neighborhoods began prohibiting clotheslines, because of the perceived unsightliness of people’s clothing and bedding blowing in the breeze. It all came to a head in 2009 when Lyman decided enough was enough. 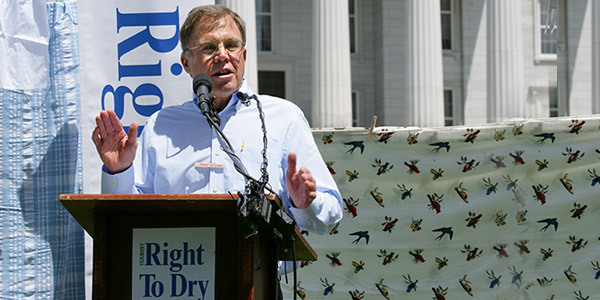 “There is nothing more consistent with a Vermonter’s heritage of practicality, frugality, and common sense than hanging laundry on a clothesline and allowing nature to dry it with zero use of energy.” Lyman led the “Right to Dry” campaign in support of a bill that would outlaw bans on the use of clotheslines in Vermont. Vermont’s Right to Dry is a simple, but important way that we can use our natural resources wisely. Even more importantly, it is a symbol of the Vermont lifestyle that we believe is worth protecting for the next generation. So instead of tossing your laundry in the dryer, next time let your clothes hang free, so nature can do the work. Breathe deep the scent of summer, and remember the Green Mountains and lush valleys of Vermont, the place where Freedom and Unity isn’t just a state motto. I think this is great! Stand up for your right to dry! Some things can’t handle a dryer and would fall apart and its not going to dry as well draped over the furniture inside. Anyway the world is becoming more and more restrictive! Fight back! When we had good weather here in Ohio, my mother (who only owned a washer) always hung sheets, pillowcases, towels and other clothing outside on the clothesline. I often think of her hauling baskets up the basement stairs to hang up the washing to dry in the sunshine and air. The sheets and pillowcases smelled so fresh and good. No one in my neighborhood hangs their clothes out anymore………there is probably a ban by the township that loves to ban everything. Perhaps I should move to Vermont! Thanks to Lyman for his efforts!! In Iowa, we have some people who use a solar dryer, and others who do not. My late wife always insisted on washing sheets and pillow cases, and hanging them on our solar dryer so our guest would have the pleasure of fresh smelling bedding. Our guests would notice and comment, to our delight. Too often people don’t care to take the time to hang out laundry; I don’t think they remember the pleasure of natural, air-freshened bedding; their loss. BTW – The Vermont Country Store has been one of my favorite sources of a variety of goods. The people are helpful, pleasant, and knowledgeable. 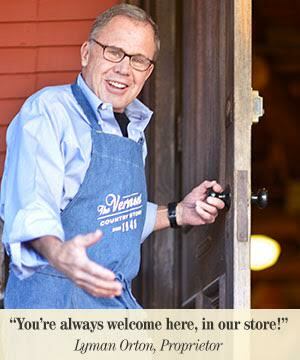 I have been a customer for nearly 40 years. I wholeheartedly agree . too much political incorrectness and not enough common sense . I remember the feel of sheets and clothes dried by the wind Lets put up clothes lines at our homes and not worry about some fascist neighborhood stupidity which comes from so few to effect so many . Come on folks Lady/Man up. We have this problem in many NJ towns! People pay lip service to wanting to save energy and the environment but not when it infringes on the aesthetics of their neighborhood. I loved using a clothesline when I owned my home. I can not believe that someone actually wanted to ban them. That is crazy! Thank you for standing up Mr. Orton!!! I never heard of a bill that would outlaw the use of clotheslines! How unwise! I live in Seattle, WA where we have 3 months of sunshine! Many of us dry our clothes on clothes lines outside during the summer and in the winter many of us dry our clothes on clothes lines in our basement. We save a lot of energy and money. My friend who lives in sunny CA, put clotheslines in her back yard to dry her laundry. She saved huge amount of money. She said if you live in sunny CA, why not use nature’s dryer for your laundry. Completely agree. Have been drying out side for quite a while. It only makes good ecological and financial sense. Wonderful I have been drying my clothes out in the US for 50 years as I follow my mothers way in England before that. I agree the sheets smell wonderful day fresh and towels too. I live in the country in Ohio. I have a clothes line. I would never live anywhere that would prohibit the drying of clothes outdoors. Keep up the good work! I myself favor the Right to Dry; though, I live in an apartment I cannot wait to have a place where I can use the Right to Dry. One of my favorite childhood memories is helping my mother hang clothes in our sunny Southern California back yard. Must write a story about it one day for the grandchildren. Never a better time than now to share “A Memory.” As a Birthday Gift for my Mom, one year us kids decided to write a favorite memory of our childhood for her. One of MY favorite memories was titled: “Crisp Sheets on the Clothesline.” Needless to say, and so many, many years later, I can STILL feel AND smell those sheets! AND THAT MEMORY LINGERS– on, and on, and . . .
HI I LOVE YOUR STORE. I HAVE BOUGHT MANY THINGS FROM YOU BUT A LOT OF YOUR THING IS JUST OVER MY BUDGET. I DO MEAN OVER, I’M SORRY. I DO LIKE THE FEEL AND SMELL OF THE FRESH SHEETS OR CLOTHES IN GENERAL. WE LIVE OUT IN THE COUNTRY AND WE HAVE A LOT OF BUGS AND BIRDS AND I DO NOT HANG ANYTHING OUTSIDE ANYMORE. HAVE YOU EVER TRIED TO GET BRID POOP THAT THEY HAVE EATEN POKE BERRIES OUT OF ANYTHING. IT IS HORRIBLE. I APPRECIATE ALL OF YOUR EFFORTS TO GET THE CLOTHES LINES BACK UP BUT ONLY IF YOU KEEP THE BIRDS AWAY AND THE BUGS AND SPIDERS TOO. THANK YOU AND THIS WILL NOT KEEP ME FROM BEING A SATISFIED COSTUMER. SINCERELY KEN AND JUDY ROBERTS. THANK YOU SO MUCH!!!!!!!!!!!!!!!!!!!!!!!!!!!!!!!!!!!!!!!!!!!!!!!!!!!!!!!!!!!!!!!!!!!!!!!!!!!!!!!!!!!!!!!!!!!!!!!!!!!!!!!!!!!!!!!!!!!!!!!!!!!!!!!!!!! I love it that you went to bat for all the “clothesline people”. Hanging clothes in the fresh air and sunshine was one of my favorite activities. We had five children and it was my perfect excuse to get out of the house. It was especially enjoyable in the fall and Indian Summer and the clothes smelled wonderful. My heart is still in New England but now I live in a townhouse where clotheslines are considered “tacky”.But we have a deck that faces the woods and I still sneak a clothesline up occasionally when I wash blankets etc. The fact that the law was passed shows that Vermonters still have an abundance of common sense. Amen! : ) I’ll take Lyman’s lead if such efforts are ever needed in Montana. Thanks for the example. So happy it was successful! I love Vermont! And all it stands for. I also thank the Orton family for all they do to help us live simply, practically, and peacefully in our rapidly changing culture. Yay! That’s what love best! Hanging the clothes in the sun on the line for one and then smelling the cleanness that only outdoor drying Can give!!! I hang over dry in dryer any day! shrinks clothes a little. Happy to save energy!! I miss that so much. Grew up in Illinois and mom always hung our sheets out. I’m in California and the air is so bad that its not worth getting your sheets dirty by hanging them out. Way to go, Lyman ! Thank you ! My 80 year-old mother lives in California, and I wish someone there would push for “right to dry”. Her senior mobile home park banned, not only clothes lines, but also the racks that can be set up on a patio or balcony. Being on a fixed income, she could save money by drying her clothes outside, and, besides, she loves the smell of fresh dried clothing and bedding. I told her to use a clothesline anyway, and if the managers cite her, to take them to court for denying her the right to use “alternative energy” to dry her clothes. She’s too afraid to be kicked out of the park, and won’t do it. I guess I can’t blame her. I remember my Grandma only having a washing machine. The same with my mom. All our clothes and linens were lined dried. The smell is unforgettable. I must move to Vermont. As a little girl I has spent many summer days at my grandma’s house. I remember all too well helping my grandma hang her laundry out to dry and collecting it from the line afterwards. The fresh smell was nothing to forget as we’d fold it on the kitchen table. I long for those days as they were special.